Can The GFX Apocalypse Graphics Package REALLY Help You Create Stunning, High Impact Sites & Pages for Dirt Cheap? Is GFX Apocalypse Truly a Fast and Easy-to-Use Graphics Package? So you have your categories all nicely organized to choose from, and you can even create your own categories and insert images into it. Here's where you can see all your images and even search for specific types. When you're ready to use a image, simply click 'use image' on the right and you'll be able to insert into your pages/posts. So when you're creating a new page or post, the 'GFX Apocalypse' icon you see in the screenshot above allows you to easily insert images you select. You're not limited by the images in the collection, you can add your own as shown in the screenshot above. This way, all your images can be nicely organized inside of Wordpress for easy access at any time. Banner Ad Sets (72 Banners) - You can use these banners to advertise an offer on your site, or use them for media buy campaigns to advertise on other websites. Business Characters (156 Character Designs) - These can help bring your content to life and add personality to your site. Cartoon business characters are proven to get people's attention. Discount Stickers (48 Designs) - Highlight your limited time or discount offer and make it more noticeable, so more people take action. Facebook Banner Ad Sets (30 Designs) - Inside your Facebook posts and for Newsfeed Ads, these banner ads can help increase click-thru and drive more traffic to your offers. Facebook Timeline Covers (90 Designs) - Make your Facebook fanpages stand out and appear professional. These templates are easy to edit and help attract more fans/followers to your pages. Feature Boxes (120 Designs) - One of the biggest trends in web design is to use 'graphical navigation' through feature boxes. Basically, these feature boxes on your homepage make it easy for visitors to navigate your site. Guarantee Badges (90 Designs) - Guarantees are 'risk reserval' elements that increase conversion. Make your guarantee stand out, and you can even highlight the guarantee of the affiliate program you're promoting (to presell your visitors better). Guarantee Certificates (40 Designs) - Similar to the guarantee badges, but with more content and can make your guarantee appear more credible. Header Designs (60 Designs) - Usually the first thing people look at when they land on your site. Having these header templates available can save a bunch of money on designers. Headline Graphics (114 Designs) - The single most important element for increasing the conversion rate on your page. Making your headlines stand out and grab attention can give a nice conversion boost. High Converting Buttons (90 Designs) - After the headline, the Call-to-Action elements on a page are most important. Using these different buttons can attract higher click-thrus (and more Sales). Logo Designs (126 Designs) - Having logo designs to use can save hundreds of dollars on designer costs by itself. Logos are usually the most expensive graphical element to outsource. Polygonal Backgrounds (70 Designs) - These can help your sites really stand out graphically. Just be careful not to make your sites TOO graphical, especially if you're in a B2B niche. Price Tag Stickers (60 Designs) - People are conditioned to look for 'price tags', so these graphics can add that familar element to your pricing and help people take action. Sales Page Designs (3 Designs) - Very expensive to outsource, very difficult to design on your own. With these modern sales page designs, you can scream professionalism and credibility to your potential customers as they're viewing your salespage. Social Media Quotes (114 Designs) - I feel that just this module alone is worth the price of the package...because good social media quote can keep your fans engaged and help your content spread virally. Testimonial Boxes (90 Designs) - Social proof is an incredibly important conversion element. Whatever testimonials and feedback you have, whether its your own or from an affiliate program, you can highlight them with these awesome boxes. Warning Boxes (90 Designs) - these can be used to 'warn' about limited time offer that are expiring or any other type of scarcity/urgency to increase your Sales. Web Icons (180 Designs) - Spruce up your content, surrounding plain text with the cool icons to keep the reader visually engaged. The more people read your content and stay on your site, the better your search engine rankings will be. 5 Top Secret Modules - obviously these are reserved for Members of GFX Apocalypse and can't be discussed here. You'll be able to see them on the inside. Alright, so now that you've seen what this package is made up of, the real question is, what are biggest benefits of investing in it? The BIGGEST benefit of GFX Apocalypse, by far, is that it can engage your visitors through visual impact - and higher engagement is directly tied to higher conversions. And another huge benefit is having a Wordpress plugin that helps you organize and use all these graphics more efficiently. I'll get a commission if you purchase through my link, so to add value, I've personally created the 'GFX Apocalypse Fast Cash' Academy, which is a series of regular short lessons and quick tips, delivered to your email one at a time. 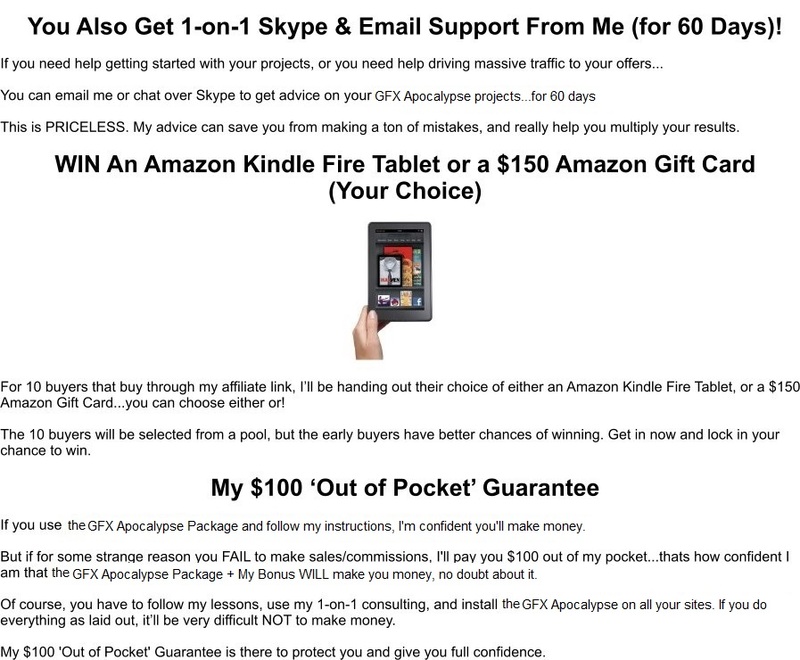 Once I verify that you purchased through my link, I'll send you access to the bonuses. Of course, I can’t offer this exclusive Bonus for too long. There's only so much consulting time available, and the prizes are limited as well. So if you want to build a strong online business, buy this product now while there's a steep discount being offered (great deal). Get started by picking up GFX Apocalypse here and then entering your name & email here to reserve my awesome bonuses. Any questions or comments, don’t hesitate to post on this thread or PM me. I’m excited to help you scale up your online business & PROFITS... FASTER! After my first 2 years of losing over 10K in internet marketing SCAMS, I am now a 6+ year IM veteran with lots of experience building Niche Sites, Ecomm Stores & running PPC campaigns. I've made most of my money through Affiliate Marketing, Adsense & Infoproducts. I promise to provide lots of FREE VALUE from all my experience over the past decade! I wanted to know if this is compatible with Wordpress? Yes it is...it comes as a wordpress plugin and you can also access all the graphics separately. Hi, I have responded to your PM. It seems that my emails are being filtered by your email provider, and maybe so are the support desk emails. Please check your PM for further details. Can you change the text in the graphics (on the fly)with out a program like Photoshop? No you would still need an editing software...but Gimp (free) is more than enough for your needs and there's all types of free online image editors as well. Can this be installed on more than one website (plugin)? If not, do you offer a developer license?